If you are interested in knowing the benefits of a school uniform program or are not happy with your current provider, please don't hesitate to contact us for we will be happy to help! Garment Graphics has been in the uniform business for almost 20 years and has developed great relationships with our product partners. We offer 2 uniform options that help your school decide what program works best for the school, and then pricing is set-up accordingly. Garment Graphics will help your school determine what delivery method is best - direct to school, direct to family or a combination of both options. Our company has a fulfillment program from our Arizona warehouse that ships promptly and accurately 99% of the time! In the event of a delay, our staff will clearly communicate to the purchaser what the problem is and how we are going to solve. Garment Graphics knows that there are many choices for school uniform providers, but our company sets itself apart by offering exceptional, personal customer service. That service is extended to both the families we serve and the schools we partner with. We are available Mon-Fri 9:00 AM - 5:00 PM to personally handle any questions via the phone or email, and 24/7 via email with a prompt response promise! 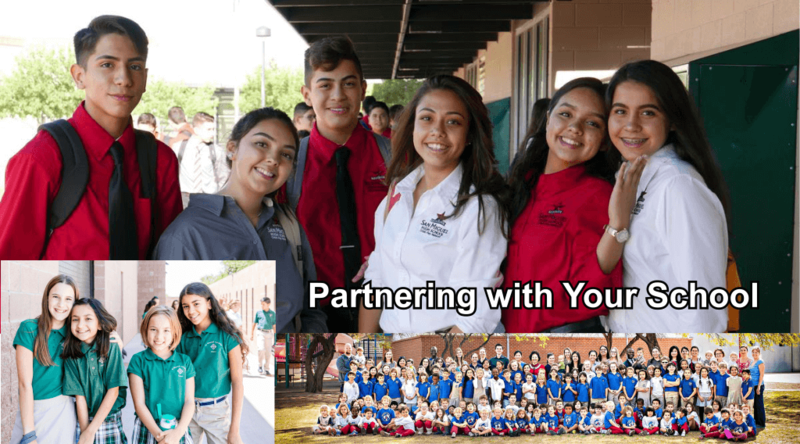 Few companies offer schools the advantage of working with an experienced uniform provider, and allowing them to buy direct to help maximize savings to the families, or to use the sales of the uniforms to help raise additional funds. Garment Graphics is a pleasure to work with. Their product knowledge, diverse options, creativity, and collaborative style are much appreciated. Their team also understands deadlines, and they do a great job keeping the ordering process moving along as quickly as possible. If you are expanding your business or school's ​brand presence, you should be working with them! Perception is reality" and parent's perceive that students have a better educational experience when their child is dressed in a uniform. Not only that, but having students in custom decorated apparel is a great marketing strategy! Schools order uniforms directly from Garment Graphics and sell the product. Wholesale pricing can be used as a fundraising opportunity, or to keep costs low for school families.